NORTH KOREA HAS promised to hold more nuclear talks with the US after a summit between the two countries earlier this week failed to produce a deal. 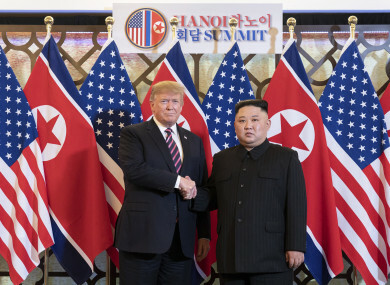 The second meeting between Kim Jong Un and Donald Trump broke up in disarray on Thursday, when a signing ceremony was cancelled and no joint declaration was issued despite expectations. Each side sought to blame the other for the deadlock, with Trump saying Pyongyang wanted the US to lift all sanctions imposed on it over its banned weapons programmes. But in a late-night press conference, the North Korean foreign minister said that Kim only wanted some of the measures eased, and that its offer to close all nuclear production facilities at its Yongbyon complex was the best it could ever offer. Despite the deadlock, the North’s official KCNA news agency reported that the two leaders had a “constructive and candid exchange” on Friday. It described the Hanoi meeting as “successful”, saying that Kim had promised Trump another meeting. Similarly, Trump told reporters that he hoped to meet Kim again before he left the Vietnamese capital Hanoi, where this week’s summit took place. “Sometimes you have to walk and this was just one of those times,” he said. “I’d much rather do it right than do it fast,” he said, before reaffirming his “close relationship” with Kim. South Korean President Moon Jae-in, who has brokered talks between the US and the North, also pointed to the positive aspects of their meeting. In a speech in the South Korean capital Seoul, Moon said the talks had made “meaningful progress” and Trump and Kim had built”more trust” and “mutual understanding”. Email “North Korea offers to hold more nuclear talks with US despite this week's summit breakdown”. Feedback on “North Korea offers to hold more nuclear talks with US despite this week's summit breakdown”.